An intimate, rare look into a very different world that has been isolated for centuries, the world of Belarusian folks songs, which were kept alive for thousands of years and are still performed today by Belarusian villagers, but vanish rapidly with disappearance of the village life and their carriers. What will happen if we mix ancient myths, lost fellow, GPS-enhanced bee, centuries-old songs, tender animation, and enchanting Belarusian ocarina? We'll get "Yur'ya. Belarusian Spring Songs" animation! Please enjoy an animated segment from "The Songs of Old Europe – Ancient Belarusian Folk Songs" documentary. "This AMAZING film, "The Songs of Old Europe" was rich, dense, informative, educational, entertaining, humorous, cinematic, engaging. Everything you'd want in any film, and certainly in a documentary." "This beautiful film helps the viewer share a rare cultural treasure that is as poignant as it is uplifting. Four stars!" "When I started traveling through Belarus in late 1990, we would stop in some of the isolated villages. The babushkas would insist on feeding us. They would then stand around the table and sing while we ate. I knew it was special. I didn't know how special, until now. Thank you for this beautiful film." "The film was beautiful!!! I can't wait to share it with everyone when I can!! You and your team did an amazing job! Part of our planets history!" A woman in native dress walks barefoot through the forest. “What is it that makes a song so influential in our lives that it becomes an indispensable part of our daily routine?” the narrator asks before taking the audience on a musical, intimate journey to remote villages in Belarus, where some of the last living vocalists of Belarusian folk songs live. Ethnographers say that Belarusian folk songs survived through thousands of years to our days in almost unaltered form. They come to us from the deepest corners of the time, arise from the distant pagan past, centuries before Christianity and long before even the medieval tunes and melodies were written, and some of them date as far back as 3000 B.C. A wide array of singers and other experts demonstrate the styles, and explain the musical structure of the songs and their connection to different rituals, seasons and regions. Shots of joyfully singing and dancing villagers show that everyone was a participant and that singing was a part of every-day life. But change is coming fast. The folk songs are gradually disappearing. Footage of technological progress, two world wars, and the meltdown of the nuclear reactor in Chernobyl is mixed with images of deserted villages, where young people are leaving and the aging singers are passing away. "I used to know so many songs, now I can’t remember even a single one. "- in touching interviews, several babushkas (elderly women) lament their deteriorating memory. Most songs have been stored in archives and libraries, but shots of festivals and concerts show how the village singers keep the music alive by performing. The documentary ends on a hopeful note with concert and interview footage of modern groups who perform the generations-old songs or combine them with modern melodies. Volya Dzemka fell in love with Belarusian folk songs when, as a student, she saw a group of young girls perform them. 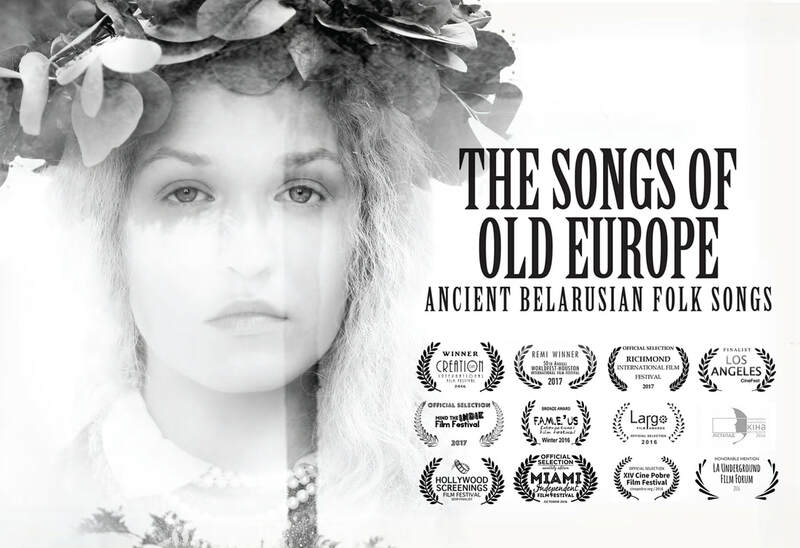 “My mind was immediately consumed by the unfamiliar harmonies, which are based on the ancient Greek musical scales.” That fascination lead her to produce and direct The Songs of Old Europe – Ancient Belarusian Folk Songs, the first ever English-language documentary about Belarusian folk songs, considered by ethnographers to be the oldest unaltered songs in Europe. Dzemka is a native Belarusian who moved to Seattle in 2003, and who herself performs these songs with her local group, VOLYA (“freedom”). The Republic of Belarus, a country of 9.5 million people that used to be part of the former Soviet Union, gained independence in 1991. Although struggling economically, Belarus is rich in culture. Isolation, caused by geography and government measures during the Soviet times that forced the Belarusians to stay in their villages, kept the singing tradition alive up until this day. But change is coming fast. Political and economic shifts, technological progress and the devastation brought by the meltdown of the nuclear reactor in Chernobyl in 1986 have had an eroding effect on the Belarusian singing tradition. The folk songs are gradually disappearing, therefore making the documentary was a race against the clock. Dzemka didn’t want to wait for funding. She financed the film with her day-time job as a translator at Microsoft, as well as other sources of income, including personal loans and a crowdfunding campaign on Indiegogo. After writing the script in 2011, she set out to Belarus, driving hundreds of miles along windings roads and past swamps in the back country, to film groups of elderly women, called “babushkas”, singing their songs in rich, loud voices. The presence of an American filmmaker made the babushkas very excited. “They were so happy and proud to share their heritage. They treated me like family,” Volya recalls. The 60-minute documentary offers an intimate, rare look into a very different world that has been isolated for centuries, and captures the bond between the women. “There are no listeners or spectators. All are participants. Singing was apart of life,” the narrator says, while the screen fills with joyfully dancing and singing villagers. The topic, although traditional, has been infused with a contemporary, vivid style and originality – the history of Belarus and some song lyrics have been visualized through animation and graphics. The Songs of Old Europe also contains authentic footage from the early and late 1900’s, as well as battle scenes shot at different medieval festivals in Belarus. Attentive viewers can even spot a local element: the opening scene was shot in Bremerton, Washington. It is the only area in Washington state that resembles Belarus, a forested country, with many lakes and swamps but no mountains. And of course, there is music - a mix of ancient songs and modern versions of the songs, performed by groups such as Troitsa and Guda from Belarus. Even some of the babushkas in The Songs of Old Europe have passed away, before they had the chance to see themselves on screen. “I’ve worked as hard as I can,” says Volya, “so our babushkas will be able to see the film and know that people around the world will talk about them and listen to their songs before it’s their time to go.” Even more importantly, Volya has ensured that this piece of living history will stay alive. Born and raised in Minsk, Belarus, Volya now resides in Seattle, Washington. She attended Belarusian State University from 1998 till 2002 where she studied Chemistry. In 2010 she graduated from the Art Institute of Seattle with a degree in Photography and specialized in fashion photography. She returned to the Art Institute to get her Bachelor’s degree in Fine Art, majoring in Digital Filmmaking and Video Production. Volya has worked as a producer, director, assistant director and cinematographer on a number of projects, such as short films, music videos and commercials. Yulia is based in Brooklyn, New York, and was born in Minsk, Belarus. Her whimsical style of animation has been screened at film festivals from Portugal to Japan, gaining wide recognition around the world. Yulia graduated from the Department of Design and Visual Communications at the Belarusian State University (Minsk, Belarus) and the School-Studio For Animated Film Direction SHAR (Moscow, Russia). Since 2003, Yulia has worked as а director, animator, illustrator and designer on various independent projects for brands, musicians, and educational and non-profit clients, with a focus on animated short film. She has also taught post-graduate animation courses and workshops. Jordan is an active cinematographer, editor, and colorist from Seattle, Washington. After high school he enlisted in the military, where he spent nine years, and served two combat tours in the Middle East. Jordan has since graduated with a Bachelor’s degree in Fine Arts, majoring in Digital Filmmaking and Video Production. He has worked on projects such as high-end television commercials, short narrative films of varying genres (action, comedy, drama, horror), music videos, corporate style videos, short documentaries, and experimental films. Director of Photography, teacher-organizer, photographer, Aleksandr was born in Minsk. He has graduated from Belarusian State Academy or Arts with a Bachelors’s degree, majoring in Directing of Motion Pictures and minoring camera operation. Since 2009 he has directed and worked as director of photography on several short films, television series, music videos, commercials, and his own creative projects. Aleksandr has a couple of international cinematography awards and diplomas from Warsaw, Moscow and Riga. Since 2010 he teaches cinematography at Andrey Polupanov film school-studio, conducts series of master classes for disabled at the workshop of social cinema. Aleksandr was one of the creators of an independent short film competition "Kinosprint"; he currently resides in Minsk, Belarus. Anatol is based in Brest, Belarus, and was born in village of Dzyatlavichy, Luninets district, Belarus. He graduated from the State Pedagogical University in Brest. Anatol is an artist who specializes in book illustrations and graphics, and his work has been shown in multiple exhibits. He also worked on various independent projects as an illustrator, animator and motion graphics artist. Nicholas Bubb specializes in audio production, audio mixing, and visual editing for postproduction assets. He is a trained musician (Drums, guitar, keys). Nicholas lived a former life in the US Army for 10 years. Nicholas operated as a combat medic/flight medic and critical care ICU nurse. In November of 2013, he was medically retired due to injuries received during the 26 months spent in OIF/OEF. He is closing out his final year of didactic education at The Art Institute of Seattle for Audio Production Engineering. He devotes his time to audio for television and radio commercials, music production, corporate presentation videos, and short documentary films. History of Belarus in 5 minutes? Easy (not really, but we have tried). Please enjoy a segment from The Songs of Old Europe – Ancient Belarusian Folk Songs Documentary. The history of Belarus in 20th century is shown through the prism of Belarusian folk songs and stories told by the Belarusian villagers... but for that you would have to watch our entire documentary.